Not specified in the Bible verses above. I have set the scene in the late morning. Sunlight (above & to the left of the figures) provides strong lighting in this scene, with strong blue cast shadows falling across the figures in the foreground. Jesus the Christ is in the centre of the scene, in blue outer robe & with a white head scarf on. 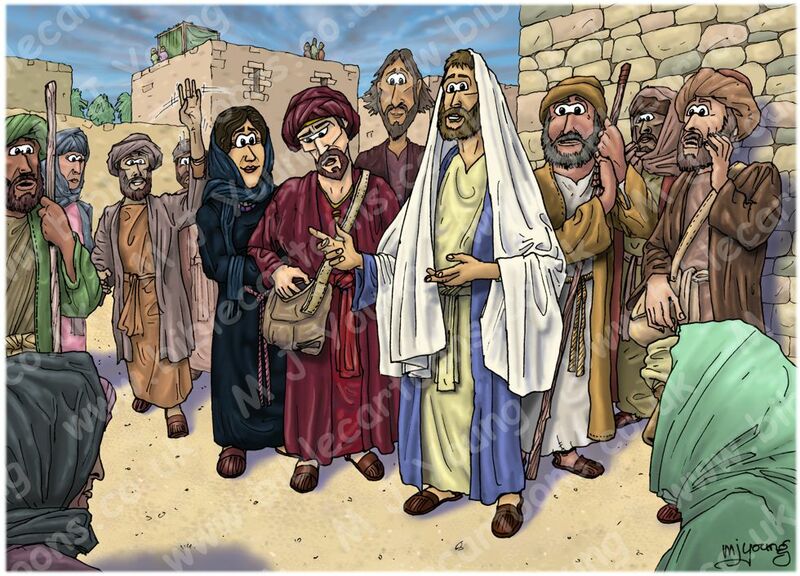 Behind Jesus & to the left is Mathew/Levi, then Judas Iscariot in red, with his hand in the money bag. To his left is Mary Magdalene, with the unnamed messenger (sent by Mary & Martha from Bethany). 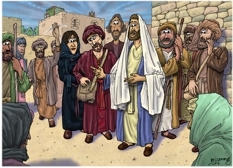 The rest of the characters present are either unnamed disciples of Jesus (though none of the 12 apostles) or else members of the crowd listening to Jesus teaching. 01) (Previous page) John 11 – Death of Lazarus – Scene 02 – Messenger (Version 01). In which I have included a dark blue building shadow across some of the figures. 02) (This page) John 11 – Death of Lazarus – Scene 02 – Messenger (Version 02). In this version I have removed the dark blue building shadow, but included figure cast shadows, so that the scene is lighter for customers to project/print. As I proposed in the previous picture (John 11 – Death of Lazarus – Scene 01 – Bethany), I believe this scene occurred some time in the winter or early spring.